It Packs a Punch ! One day some years ago a "long-liner" (a fisherman for halibut and salmon) who was also a regular customer at the restaurant asked me if I had ever heard of Fish House Punch. I hadn't that I could recall. He briefly described it and asked if I would serve such a punch to him and his fishermen friends each year when they returned home, the season being over and a cause for their annual celebration. Once a year since then, the lounge has been home to a group of about 15 long-liners and their wives. The Fish House Punch is always ready for them. A Fish House Punch is a very old punch recipe from the East Coast dating back to at least the late 1700's, as far as I can determine. These annual affairs (oops) were apparently quite successful, or should I say the punch recipe performed well? In 1885 the Philadelphia Inquirer published a poem that had been written specifically about the strength of the punch. This punch recipe is at least very close to the original. 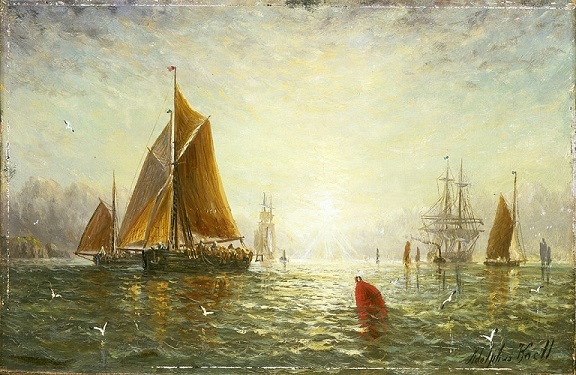 It is the one I use for the fishermen and their wives and once in a while for certain parties if they make the request. Preparation time: 30 minutes but must be refrigerated for several hours. Serves 30. Please remember, this Punch Recipe packs a powerful punch. You may need to monitor your guests as I have to at the restaurant. 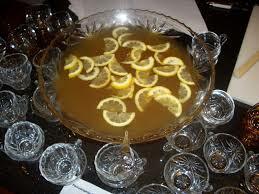 Enjoy your restaurant Fish House Punch Recipe and the company of those you share it with!